Elite Bhaji Box includes-Kaju Kesar Pista Phool (160 gm), Kaju Barfi (125 gm), Mewa Good (150 gm), Kaju Tarbooj (160 gm), Namkeen Khaste (4 pcs), Maath (2 pcs), Kaju Mix Dalmoth (100 gms). Kaju Kesar Pista Phool (160 gm),Kaju Barfi (125 gm),Mewa Good (150 gm),Kaju Tarbooj (160 gm),Namkeen Khaste (4 pcs),Maath (2 pcs),Kaju Mix Dalmoth (100 gms). Exotica Bazaar is a world of true authentic and traditional sweets and believes in bringing happiness with each bite. It is involved in pick and delivery of a varied range of tempting sweets and other delicacies. Delighting customers from all over India, our range of products not only include our famous pure sweets but also snacks, biscuits, namkeens and handicrafts too. In keeping with the motto of 'bringing India at your door steps', The online portal cover almost every sweet which are popularly known and consumed by Indians all over the globe. 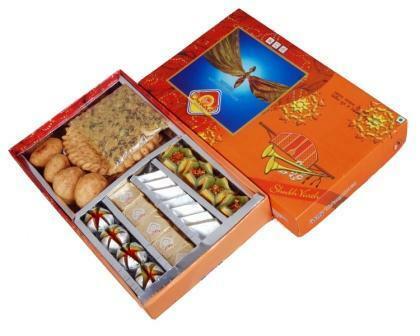 Different delicacies are available online which are good gifting options for various occasions. Authentic and extremely famous, Exotica Bazaar Sweets is now much more conveniently available in many cities of India. So, wherever you feel and find yourself in the mood for a tasty bite, you are just a click away to have it, from Exotica Bazaar. Purchasing products from Exotica Bazaar are reliable in terms of quality, hygiene and price as well. Do browse our website to know more about us and our offerings. We assure you, it will definitely have a feel like we are actually bringing India at your door steps.